In-Depth: Garmin Pay Provisioning Company Fit Pay Hopes to Build on Early Lead with Spin-Off, but Larger Competitors are Gearing Up | NFC Times – Near Field Communication and all contactless technology. Fit Pay, which provisions tokenized card credentials for Garmin Pay, will spin off in coming weeks, though it remains to be seen whether it can keep what it believes to be its competitive advantage among third-party provisioning companies targeting the payments wearables market. NFC TIMES Exclusive Insight – U.S.-based Nxt-ID disclosed late Thursday that the spin-off of its payments unit, Fit Pay, which provides bank card provisioning for Garmin Pay, would again be delayed, as it waits another couple of weeks for the closing of a nearly $17 million loan it needs to move forward with the new company. Fit Pay, which also provides tokenized payment card provisioning for the smaller SwatchPAY! project in Europe, would list separately from parent Nxt-ID on Nasdaq under the new name PartX, as it seeks to expand its business in the payments wearables and IoT market, while promoting other products. This premium content is only available to subscribers. Article has about 2290 words. Get access to all premium content and the world’s first global newsletter devoted to the NFC and contactless markets by subscribing to NFC Times, the most authoritative source for news and analysis in the industry. If you already have a subscription, log in here. NFC TIMES Exclusive Insight – While Australia is the top market worldwide for use of contactless bank cards at retail, any hopes for those same open-loop cards and card credentials on NFC phones being used as part of a nationwide, interoperable transit payments service have been dashed for now. Analysis: Apple Announces Breakthrough with Apple Card, but is It Mostly Slick Marketing? NFC TIMES Exclusive Insight – With typical style and élan, Apple introduced its new credit card, Apple Card, at a product launch event this week, one of several new services the tech giant is counting on to provide growth as its iPhone sales slip. NFC TIMES Exclusive Insight – U.S.-based Nxt-ID, whose Fit Pay unit provides payment card provisioning for Garmin Pay, has announced a closing date for a $16.5 million loan it will use for working capital and to refinance an existing loan. NFC TIMES Exclusive Insight – Commonwealth Bank of Australia, one of Australia’s largest banks, has said its mobile wallet transactions have increased by nearly three times in the two months since introducing Apple Pay, according to a report, though the bank declines to release any actual transaction figures, and mobile transactions still are believed to make up a very small percentage of total transactions. NFC TIMES Exclusive Insight – When it launches its SimplyGo service April 4, Singapore’s Land Transport Authority will become the first major transit authority in Asia outside of China to launch acceptance of open-loop payments of fares. NFC TIMES Exclusive – As QR code-based mobile payments continue to threaten take-up of NFC technology, especially in Asia, the NFC Forum industry trade group is taking action. NFC TIMES Exclusive – The developer of Visa’s new transit secure-access module, or SAM, said the technology could potentially help turn even a low-end, closed-loop transit-ticketing system, such as Mifare Classic, into an EMV-enabled payments system–although that could still require transit operators to install new acceptance terminals, and they would still need to set up a back-end system to support it. 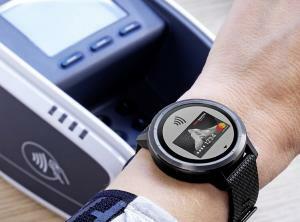 NFC TIMES Exclusive Insight – Small Swedish analog watchmaker TRIWA next week plans to launch payments wearables enabled for tokenized Mastercard-branded cards issued by Swedish banking group SEB, with provisioning company Fidesmo telling NFC Times there will be more watch brands to come enabling payments. NFC TIMES Exclusive Insight – While Apple’s deal with Goldman Sachs to jointly roll out a new credit card this year integrated with Apple Pay and Apple’s devices made headlines Thursday, it was neither the first news of this partnership nor the first deal of its kind for Apple. NFC TIMES Exclusive Insight – Sony has introduced its NFC-enabled smart watch strap, Wena, to the UK and Ireland, which will allow users to turn their analog watches into hybrid smartwatches and tap the straps to pay with tokenized EMV-compliant cards loaded into the devices from wallet apps. NFC TIMES Exclusive Insight – ­The Heathrow Express airport line serving London will begin accepting contactless open-loop payments along with closed-loop Oyster cards next week–more than six years after commuters first could pay by tapping their bank cards and NFC phones to ride on buses on the separate Transport for London system.